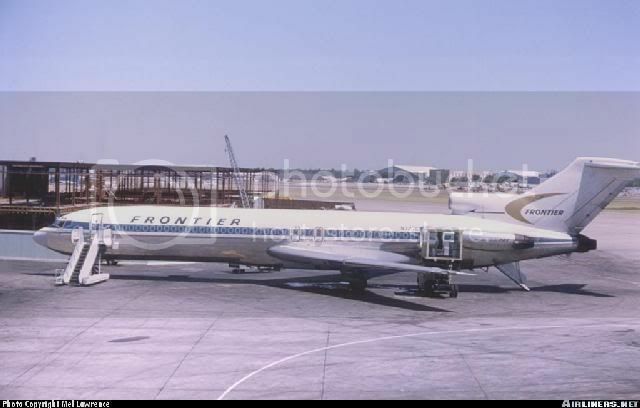 "Flying Colors of the United States"
N408BN was delivered to Frontier Airlines in 1968 by Boeing Aircraft. It was registered N7278F. It faithfully served Frontier for four years until 1972, when Frontier decided to sell all of its 727s and concentrate on the Boeing 737. N7278F at Dallas Love Field shortly after Braniff has bought her. 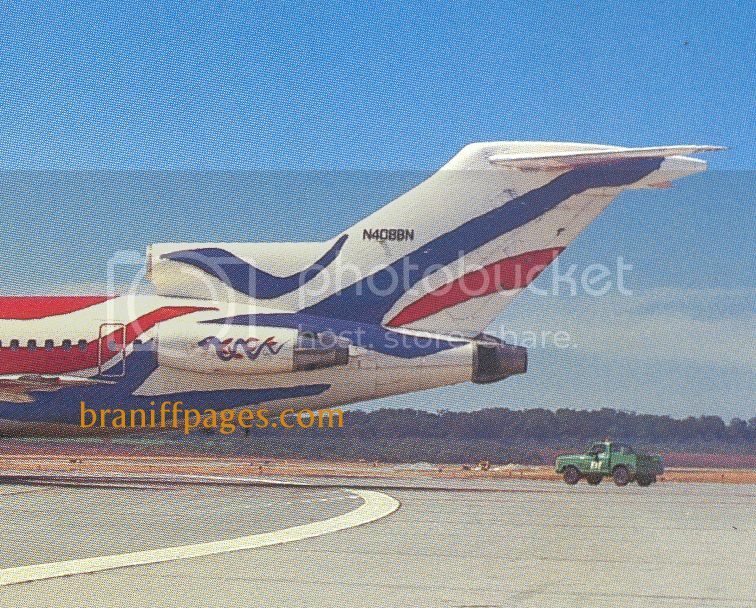 N7278F was one of many 727-200 series bought by Braniff from Frontier in 1972, and it was re-registered N408BN. In 1975, N408BN was selected to be the "flying canvas" for Alexander Calder's Bi-Centennial paint scheme. She would sport this scheme for seven years until Braniff's shutdown in May, 1982. N408BN was given the nickname "Sneaky Snake" by Braniff pilots and engineers. There are two reasons for the nickname. Calder, shortly before his death in 1976, painted a snake on the number 1 engine nacelle cover. (It originally was introduced with just a red ribbon design on this nacelle) The second reason is because N408BN had a "trim problem." It would never "trim" correctly, so Braniff Pilots had to constantly re-adjust altitude and heading by hand. (Normally once you get an aircraft to cruising altitude, you can "trim it out," and it will fly straight and level for a long time with just a few minor course corrections) You can imagine that most Braniff pilots did not enjoy flying the "Calder 727." When Calder originally painted N408BN, he intended for the No.1 Engine Nacelle to have a "snake-like" dragon design. He finished this nacelle along with the No.3 Nacelle "Stars and Stripes" in 1975. However, when Washington got word of a "dragon" on a plane that would be dedicted by First Lady Betty Ford, they wanted a design change. 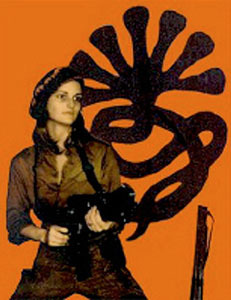 In 1972, media mogul William Randolph Hearst's daughter, Patty Hearst, had been kidnapped by the "Symbionese Liberation Army (SLA)." They wanted to start a revolution against the U.S. Government at the time. Patty Hearst was spotted as a brainwashed terrorist during a 1974 bank robbery. The symbol for the SLA was a "snake-like" dragon. Calder never intended for his "mythical creature" to symbolize a terrorist group, but unfortunately, in 1975 it did. So Braniff engineer A.R. Davis added the red stripe (so well known) on an alternate engine nacelle. Calder's original dragon was wrapped up for later. It was eventually installed on the aircraft in the late 70s (after the demise of the SLA). N408BN also was always in the "shop" for mechanical problems. The Las Vegas Operations Manager told the Braniff Pages, "We tried to keep N408BN away from Vegas...because we knew she would be in the hangar for a couple of days." It seems that "The Flying Colors of the United States" was just as tempremental as the artist who painted her! In 1982, Braniff recalled N408BN (along with the rest of its fleet to D/FW). It would sit idle in the D/FW area until 1984. On March 1, 1984, Hyatt Hotels launched Braniff, Inc (Braniff II). N408BN joined the other 29 727s Braniff had managed to hold on to. However, she had been re-painted in the corporate "red, white, blue and grey scheme" that was applied to the entire fleet. 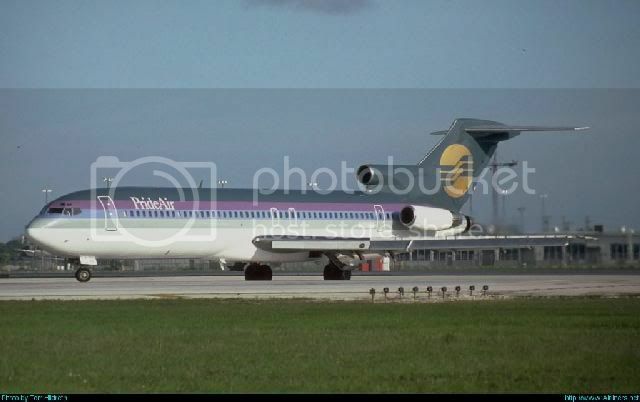 In 1985, because of low passenger demand, twenty of the thirty 727s Braniff was operating were grounded. N408BN was one of these. It was taken out of the fleet on February 19, 1985. Photo by Tom Hildreth on "Airliners.net"
IAL sold N408BN to Columbia Pictures in 1995 for the movie "Bad Boys" starring Martin Lawrence and Will Smith. Towards the end of the movie, the cops (Smith and Lawrence), have a shootout with the drug dealers in a Miami hanger. 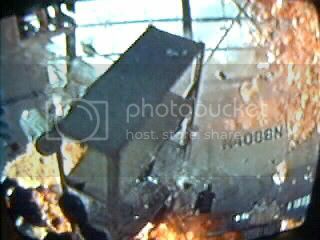 One of the "Columbians" boards N408BN (now painted all white and everthing valuable removed) and Lawrence fires his gun at some flamable containers near the tail section blowing up the bad guy and the plane. 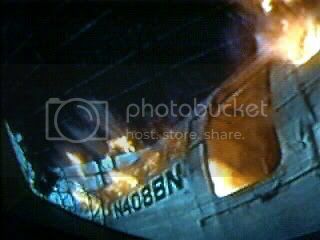 Video Captures of N408BN in Columbia Pictures' "Bad Boys"
An explosive end for a very "colorful" aircraft! As you can see, N408BN flew with no less than seven airlines after Braniff before she became a movie star in 1995. Her airframe was registered N408BN at the very last of her long life. 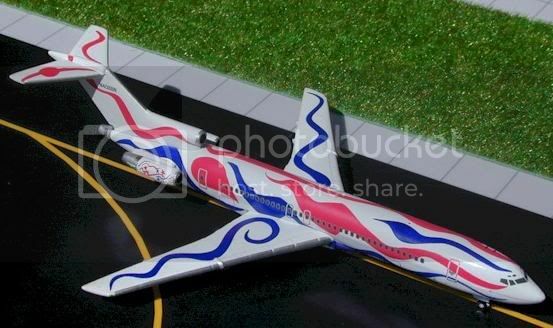 "Flying Colors of The United States" Model by Gemini Jets/A.D.I., Inc. This model was licensed by "The Calder Airplane Project." So Calder's vision does still live on...if only in models.